Question: How do you feed your family when grocery and gas prices are going up? How do you get your child to eat his or her vegetables? How do you get your kids off the couch and outside? The Answer to all of the above: Grow your own food! 10,000 years ago at the time of the first agricultural revolution, when people complained about having to walk so far to get their food, the answer was the same: Grow your own food! After 10,000 years, we seem to have the same transportation problem: excessive energy output for less food results. Another agricultural revolution is at hand. I’m calling it “Backyard Abundance” or maybe “Edible Landscapes”. You might be amazed at how much food is produced from one inexpensive, little packet of seeds. 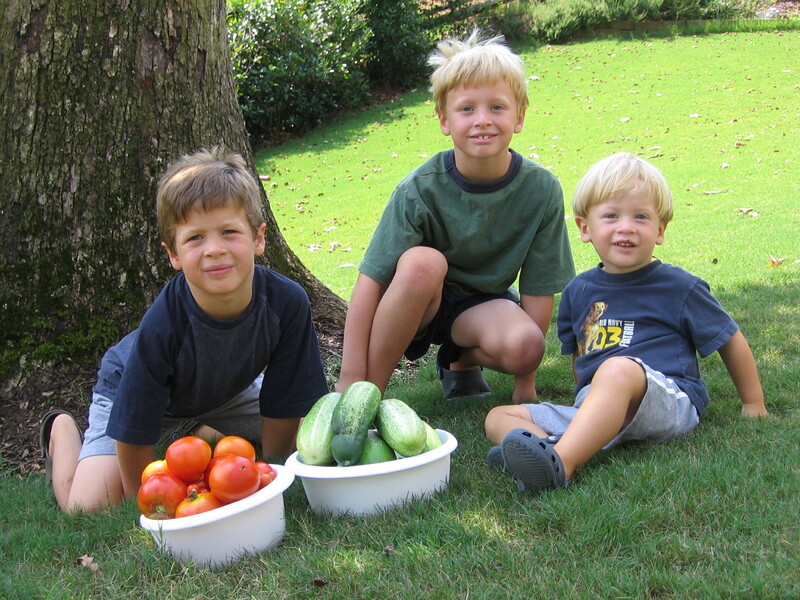 My sister, Heidi, found out how easy it is to have backyard abundance, and her kids are learning, too. It all started with the tomato plants she grew along the fence near the swingset. Heidi doesn’t even like tomatoes, but her husband does, so she grew them and had her sons help her pick them as they multiplied almost out of control. Heidi said when her son Jack, age 6, is just sitting around watching TV, she can say, “Come on, let’s pick tomatoes,” and he’ll drop anything to go outside with her to the tomato patch. Her oldest son, Adam, age 7, loves to pop the cherry tomatoes directly into his mouth from the vine. You don’t get much fresher than that! Next in the evolution of her garden, at the other corner of her backyard, she started growing parsley, rosemary, thyme, oregano and chives. She then was able to go out to the backyard and snip a little bit of herbs for her dinner recipes. The amount of herbs called for in a recipe costs about $1.50 to buy in a grocery store. At a nursery, she bought the whole plant, which comes back year after year, for little more than that. When I go over to help with dinner, I bring Heidi’s three boys out to the herb patch to gather what we need for the salad dressing and have them help me make it. The two-year-old, Kyle, scoops up handfuls of fresh thyme, chives and rosemary and chews them up. I have to go out and harvest more because he’s eaten so much. For Adam’s fifth birthday, I bought him five blueberry bushes for the backyard. I gave him blueberry bushes specifically because Adam has Type-I Diabetes, and blueberries are very good for helping with the health complications that might come with diabetes. I thought it is never too early to build healthy capillaries and instill good eating practices, which are important for everyone, and even more important to Adam’s long-term health. When Heidi saw my gift, she said, “I don’t think they’ll like blueberries.” I came prepared. The little bushes weren’t in fruit, yet, so I brought a pint of fresh blueberries with me to show them what the bushes would produce later that year. When they looked at the bowl of smooth, dark, bluish-black berries, they turned their little noses up. I took a few and started munching, exaggerating my “yums” until they slowly edged up to me and tried one. The blueberries became a hit. Adam, who was 5 at the time, and Jack, who was 3, wanted more. I told them they were lucky to have bushes in their backyard that would grow more blueberries later during the summer. Suddenly, they were excited. Now, they get many pints of berries each year, but it’s hard to really know how much they get because they eat so many of them right off the bush. Heidi and Mike, her husband, let a few canes of blackberries grow along the fence, so they all harvested enough berries for a few cobblers. 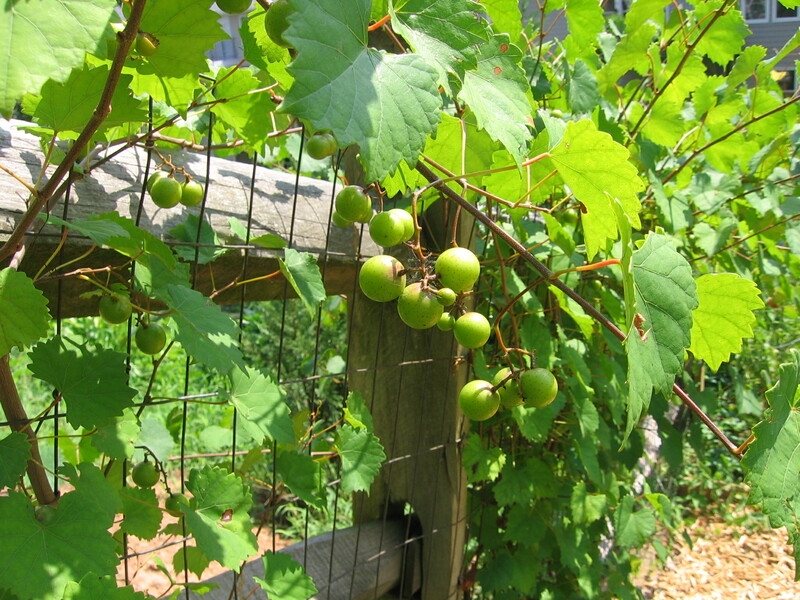 This spring Heidi added a muscadine vine that grows next to the tomatoes. Right now it’s loaded with grapes that are too hard to pick, but we’re all waiting for them to ripen so we may try them. Unripe Muscadines, very high in antioxidants, like resveratrol! The most recent addition to Heidi’s garden came late this spring when I brought over a packet of cucumber and pumpkin seeds. They had one more corner area along the fence that would be a good place for them, I thought. I sank the seeds into the ground with the boys helping me with spades and trowels. A few weeks later I get a call from my nephew Jack, telling me excitedly about all of the sprouts. In early July, he calls me again and tells me, “We’ve got cucumbers growing everywhere! But we have to wait for them to get 6 inches long before we can pick them.” A few days later I had the joy of sharing the very first cucumber off their vine, which was the very first cucumber Jack ever ate. He wouldn’t eat them before, but now that he has taken a part in their growing, his taste has changed. We’re all eagerly watching the pumpkins in the pumpkin patch start to turn a beautiful orange. The boys already have one picked out to carve for Halloween. I’m thinking about pies and soups. 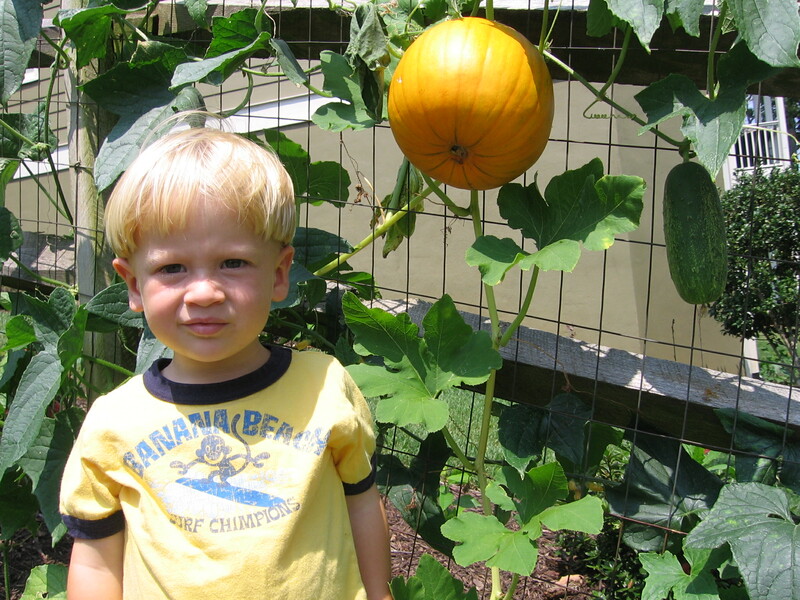 A week ago when we were out collecting cucumbers, the boys asked, “When these die, what can we plant next?” I smiled at my sister, and we started thinking out loud: “broccoli, collards, salad greens, peas, beans…” as we went through the seasons in our mind. I’ve been trying to talk Heidi into getting a fig tree, but she’s not crazy about it. It probably sounds like Heidi and her family have a huge backyard, but it’s actually not that big. 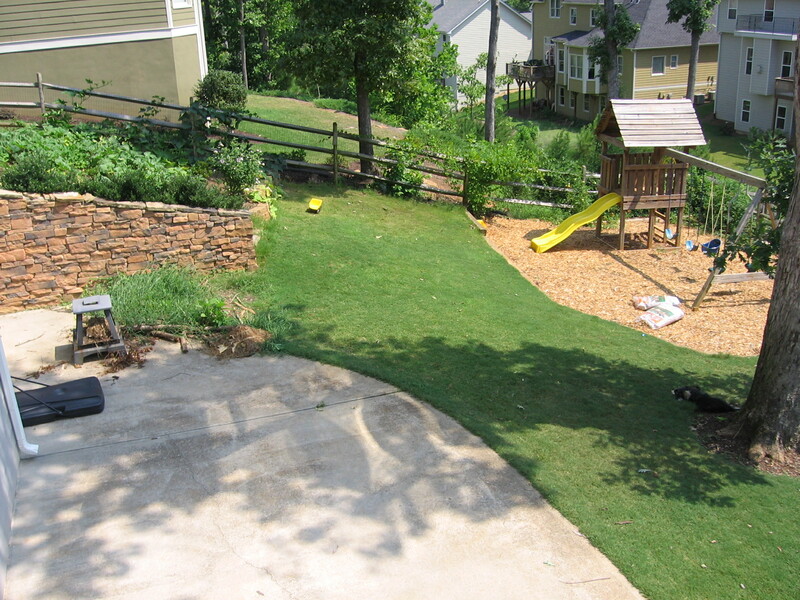 I added a picture of the backyard so readers could see that she lives in a typical Suburban-Atlanta subdivision with a smallish backyard. I really want readers to understand how possible it is to grow one’s own food. We haven’t done the math, but Heidi’s family and everyone she has shared her abundance with has saved money on groceries. Plus, her kids are actively involved in the revolutionary learning process of getting outside, counting the produce, watching the cycle of the seasons, learning what time of year certain foods ripen, the botanical parts of plants, and wanting to eat their harvest. That’s priceless. Heidi's Backyard. Top left is the pumpkin and cucumber patch. Top right is the muscadine on the fence and tomatoes behind the swing set. The blueberries, blackberries and herbs are to the right of the camera, not visible.